Wild Mane Photos is helping to raise funds for Now I Lay Me Down to Sleep (NILMDTS). 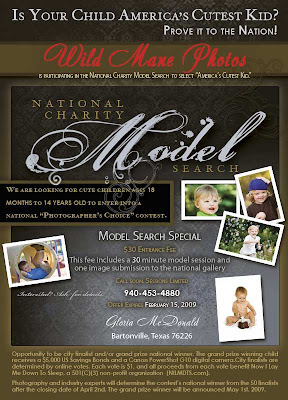 This 501C3 non-profit organization is has 6,000 photographers who give of their time and talent to help parents who are going to lose their new baby. During this time after the birth of a baby that should be full of joy, in some cases can be a time of confusion and great sadness. Professional Photographers volunteer to take beautiful and touching photographs of the parents with their child. As time passes, the photos are an important part of healing and remembering their beloved baby. Now I Lay Me Down to Sleep is searching for "America's Cutest Kid". There will be city winners and one national winner. Parents, grandparents, family and friends can vote for their favorite "Cutest Kid" for $1 per vote. Each $1 goes directly to Now I Lay Me Down to Sleep. Wild Mane Photos is offering special pricing to take pictures for submission. We are offering a 30 minute session for $30 with the best photo from the session to be prepared and submitted to NILMDTS for voting. If you prefer, I will do a mini shoot for $99 which will include an 8x10, 2 5x7s and 8 wallets of one pose. Take a look at the flier and please visit the Now I Lay Me Down to Sleep website for more information about this very special organization.